Published on April 7, 2010 in corruption, General T&T, Law, PNM, Politics, UDeCOTT, Uff Report and USA. 16 Comments Tags: Calder Hart, Jack Warner, Keith Rowley, Patrick Manning, Politics, Professor John Uff, report on the construction sector, T&T Govt, UDeCOTT. The Government is giving itself two weeks to reconstitute the board of directors of State-owned Urban Development Corporation of T&T (Udecott). 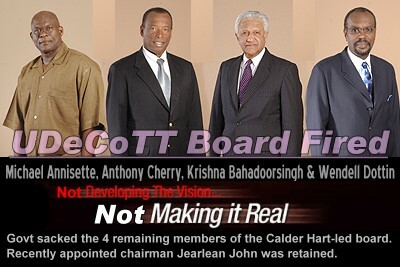 Well-placed sources made this revelation last night, after the Government sacked the four remaining members of the old Calder Hart-led board. In a statement to the Senate yesterday, Attorney General John Jeremie announced that there would be a ‘reconstituted’ UDeCOTT board-save for its recently appointed chairman Jearlean John- and thanked the outgoing members for their services.